It’s a cold March day and I’m sitting in a graveyard. No, this is not a sudden onset of existential angst, I’m having my photo taken! This may seem like just desserts by those HBNers who took part in the portrait Photoshoot that I organised a couple of weeks ago. There, they had to pose, smile, answer my every whim as I lorded it behind the camera. The activity aroused in me a desire to have my portrait taken too. But not just any portrait! No, I had set it in my mind to have mine taken using a technique that would have been familiar to Isambard Kingdom Brunel in the late 1800s, wet plate colloidon photography. The idea had become ingrained in my mind when I met Yvette Bessels at a Cambridge Bloggers meeting and heard that this was her photography interest. 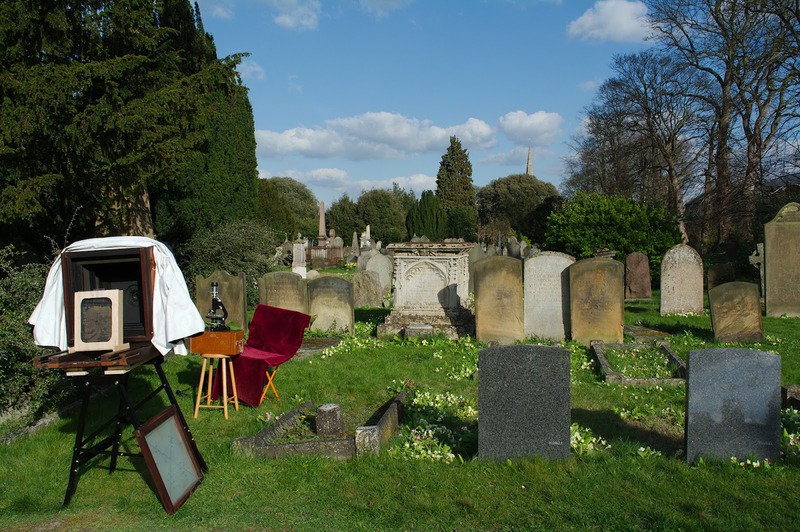 We arranged to meet up for a photo shoot on a sunny day and the graveyard on Histon Road, near her house, was a convenient location. 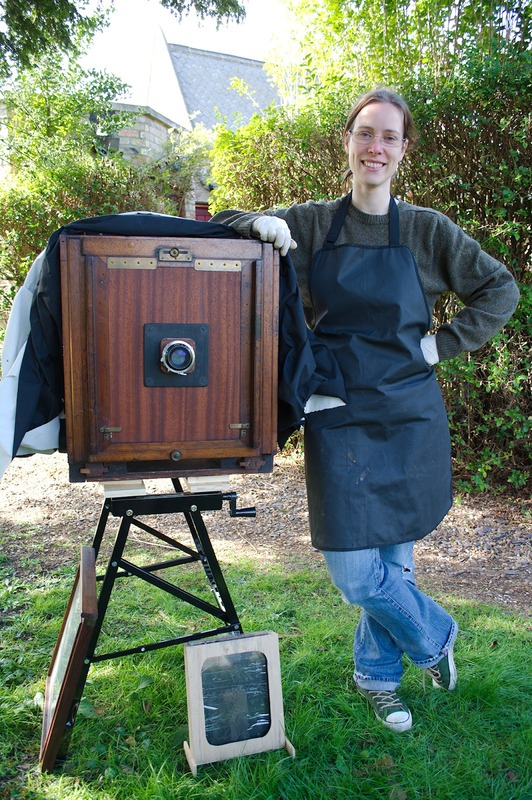 Wet plate collodion photography is pretty descriptive of the process. A glass plate is coated in a colloidon/halide solution. Collodion is an early type of plastic. The plate is immersed into a silver nitrate solution in the dark to activate it. The wet plate is then removed, still in the dark, placed inside a light-tight box and taken to a positively enormous box camera. Once the subject is posed and absolutely still, the lens cap is removed, the shutter opened and the plate is exposed for at least a couple of seconds. The plate then has to be developed and fixed before it dries out. With our HBN photoshoot, I took hundreds of pictures over two hours. There are subtle nuances and emotions flashing across the faces of the sitters. You want to capture the best one. We spent 3h in the graveyard and exposed 5 plates, of which three were exposure tests as we moved around. The most difficult aspect is posing absolutely still. Ideally, Yvette would like to have a head brace to keep the sitter still. The longest time I posed was 20 seconds in the shade. The final picture was taken deliberately as the sun when behind cloud – it was bright enough for a “short” 6 second exposure, but not too bright to make me squint. Composition was far more important with these photos that in the studio shots. I wanted to make this photograph count! So I reverted to the 19th century still pose with some items that are of importance to me and my work. Even when we had finished and obtained a well exposed and developed plate, the process was not over. I waited three days as Yvette carefully dried the plate and varnished the plate. I collected the photograph on Saturday and was pleased with the final result. The plate can be viewed as a negative with light shining through it. Alternatively, if backed by a black glass plate, it gives a positive image. Showing how the plate can appear both as a positive on a dark background and a negative on a light background. Middle image is plate placed over white and black card simultaneously. I photographed both negative and positive views. 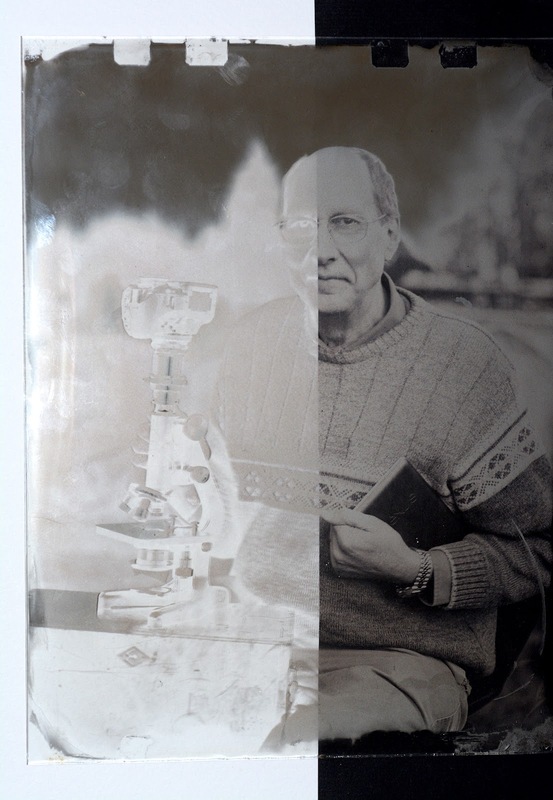 Glass can break, so I also created a digital positive from the negative plate, the final image in my online album. The final portrait after digital capture and editing. I leave you with a final note of something that can only happen in Cambridge. Thirsty after our photoshoot, we wandered to the nearby pub, The Grapes, as the friendly publican Sandy had let me park there. Coincidence 1: I plonked my box on the ground near the bar and a man seated there turned round and asked “What sort of microscope is that?”. I answered Bob, after we were introduced, that it was a Watson. Coincidence 2: We explained that we had been doing some old style photography. “Oh, glass plates? I used to do that at school”, was his reply and a discussion on photography ensued. Coincidence 3: I asked Bob what he did. 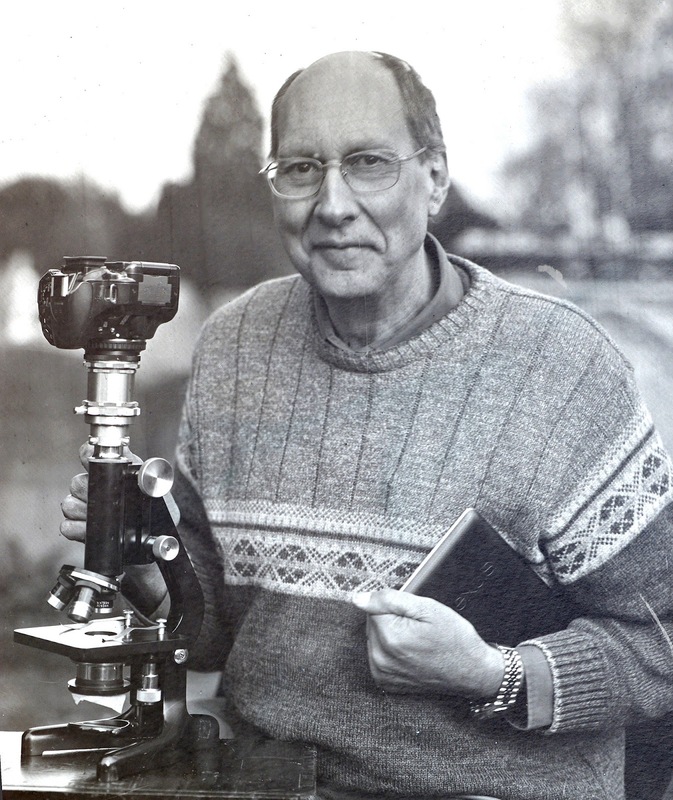 “I’m in life sciences”, – something that I had been working in for over two decades before my present business. I didn't think about this subject and behind the motivation behind this point. In any case, I am not going to ponder this post and get grade miners service from us. The one line that you directly in this post is great and pull in my considerations. Generally speaking, your post is adjusted and well presentation.